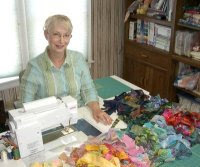 Elsie M. Campbell and Aunt Mimi's Quiltworks: Butterfly! I have always planted dill weed in my herb garden, not because I love dill in everything (which I do!) 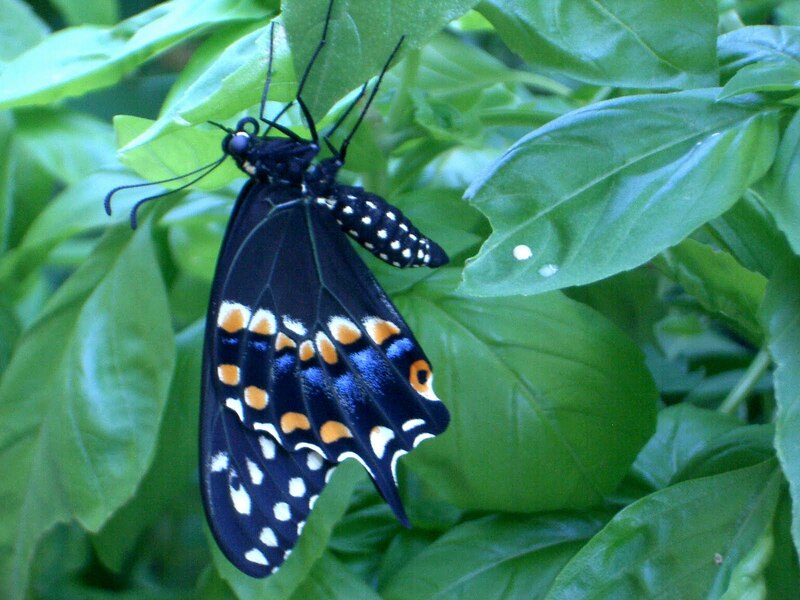 but because I know that the black swallowtail butterfly will lay its eggs on it. I love to watch the process of the caterpillar eating, growing, and changing into a chrysalis from which will emerge a beautiful, large butterfly. So, while my rehab continues to progress, I decided to bring some of the caterpillars into the house to spare them from the heat, drought and birds and to watch them go through their life cycle. 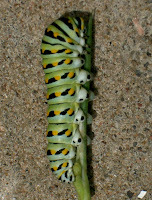 All three caterpillars turned into 3 bright green chrysali, and this morning I noticed one had turned dark. I thought at first maybe it had died, than I saw the yellow spots, and knew the butterfly was preparing to emerge. I went outside for a very short walk, and I got back just in time to watch the butterfly emerge. I knew from experience that the new butterfly has to find somewhere to hang upside down to let gravity assist it in unfurling its wings. But when I first saw it, I thought perhaps it was crippled, the wings were less than 3/8" in length! I allowed the butterfly to crawl onto my fingers to hang upside down. Within 15 minutes, the wings were unfolded, perfect and beautiful. We went outside so that I could get some photos for you, and I transferred it to my basil plant for better pics. Within an hour, the butterfly tested it wings, and he was ready for his first flight. Unbeknown to me, Sally the cat was outside with us, and tragedy struck. Sally had the butterfly in her mouth. I managed to get her to release it, but the right wing was damaged in the struggle. 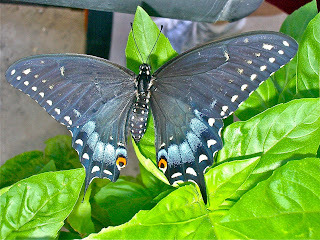 I still think it may be able to fly, but at the time of this writing, he was still hanging in the pepper plant where I placed him, too traumatized to try again, I think. There are two more to come. I will keep you posted! 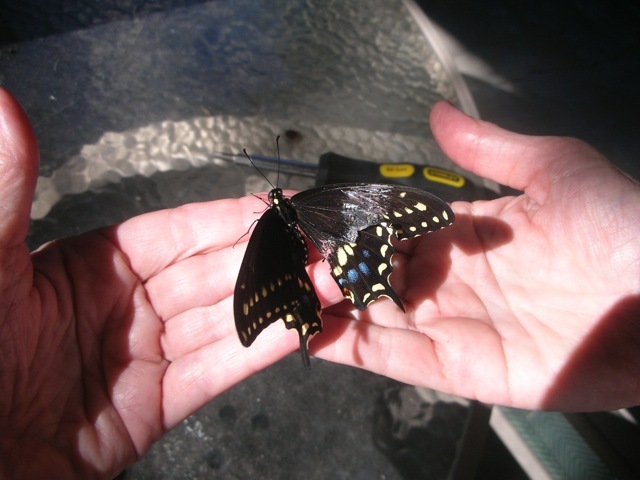 Post Script on the butterflies: Two emerged yesterday morning. 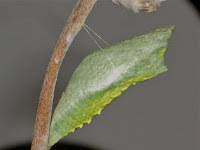 Since the chrysalis turns black and you can see the yellow spots through the thin skin about 24 hours before the butterfly emerges, I knew it would happen soon, but I had Physical Therapy for my knee. I simply packed up the jar with the crysalis's and took them with me. One emerged about 1/2 hour into my session. I noticed it first, and called for others to come look. I had quite a crowd gathered around me to watch this miracle of nature. One of the PT aides held it in her hands and had to go show everyone in the front office. 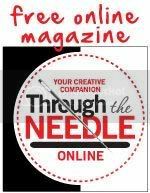 It created quite a stir! I left it there for everyone to enjoy until the time it would need to be released. 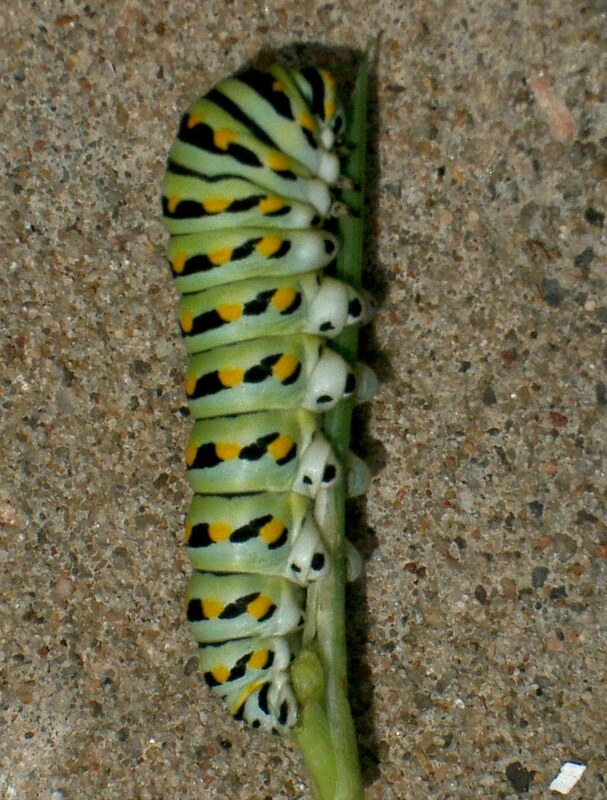 The second one emerged immediately before I left for PT, so I put it out in my herb garden. It was still there when I returned. She flexed her wings and I grabbed my camera. I was just in time to catch her right before she took her first flight over the neighbor's rooftop. I did some research on the internet and found out that this one is female. She has only one row of prominent yellow spots on her forewing and hind wing. If you'll notice, the one above with the damaged wing, has a 2nd row of yellow spots on his forewing, and very large yellow dots on his hindwing. He is male. I saw one of these butterflies today. Feeding on my Lantana bushes. I wondered what it was. So glad I found you! I'm in middle Mississippi. The butterfly will sip the nectar from just about any flower, but the caterpillar will only feed on members of the parsley family, with dill being the preferred plant of choice here. They are large butterflies and amazingly beautiful.